If you’re looking for new or replacement wood doors, then our master joiners can match the doors to suit - be it a Mediterranean restaurant, villa extension, barn-style loft, pool house or contemporary office entrance. At Adrian Harris Woodcraft, our master joiners manufacture custom-sized wooden doors (and timber window frames) from our Christchurch workshop in Sockburn. We can ship to any location throughout New Zealand. 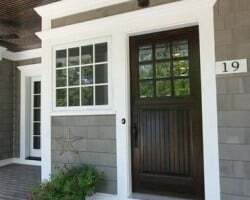 Whether you are building or renovating, choosing wood doors and windows adds street appeal and value to your new home or matches existing doors in older homes. At Adrian Harris Woodcraft, we can provide practical advice for the construction of your timber doors and matching window designs. If you have a particular timber in mind, talk to us. We can make suggestions on the best timber to use to suit your situation. Timber doors are generally supplied glazed or can be glazed on site. Regardless of the design, one thing is certain: whether it's bi fold timber doors or French doors, our attention to detail is consistent. Expect high-calibre workmanship and doors crafted in the style that matches your brief. Typically our exterior wooden doors and frames are made from cedar and hardwood with a fine and stable grain structure, ensuring years of reliable door operation. Internally, timber options can be a little more flexible. 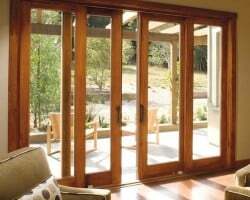 Correct installation is paramount to long term performance of sliding and bifold wooden doors. Typically your builder installs your doors and windows. Contemporary or colonial? Your wish is our command. Timber doors complement most architectural styles. Whether you want large sliding doors to provide indoor-outdoor flow to your deck and garden, patio doors to match existing windows, or a statement front door to make a great first impression, talk to Adrian and Mark. Sliding doors are a stylish alternative to the traditional hinged doors and are popular as an alternative on exposed decks. Sliding doors make ideal room dividers and cavity sliders are often a great option to save space in interior design. Sliding doors can be either glazed or traditional paneled in style of your choice. Timber sliding doors are popular for butler pantries or closing off smaller laundry spaces. We can custom make glazed or panelled options to match your home and décor. See also Adrian Harris Woodcraft wooden windows, find out about Adrian Harris Woodcraft, or contact us today to discuss options in wood doors.